The Classic Bloody Mary is actually an easy, fun drink to make. 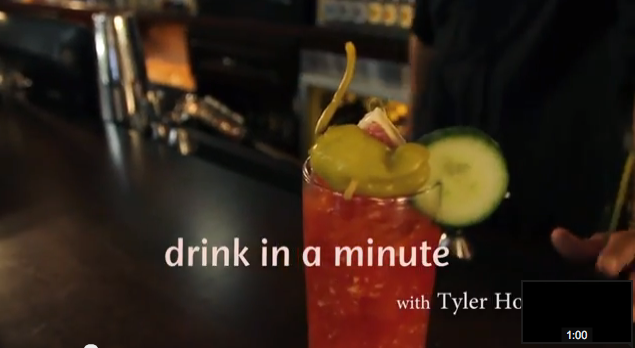 Check out our Drink in a video below to see how to make a Bloody in a Minute. Written instructions are below too. Directions: Once you have all your ingredients, simple pour them into a pint glass. Start with the vodka, then the tomato juice, then the horseradish, then the Worcestershire Sauce and finally the Sriracha. Shake with a proper shaker and pour. I’m a big fan of garnishes. I am very adamant about celery being in my bloody Mary. It’s an easy way to make a drinks special and attractive. I also like the garnish we used in the video. Salami, Cheese and a pepper. I like a little hearty meaty with my bloody! And white you are waiting for your brunch food to cook garnishes can be fun to munch on. If you liked the video, let us know. And if you have a bloody Mary video you want to share with us, please do! This entry was posted in Bloody Mary, How To by Andrea Pappas. Bookmark the permalink.